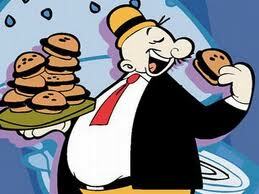 Wimpy is Popeye's friend. In the cartoons he mainly plays the role of the "straight man" to Popeye's outbursts and wild antics. 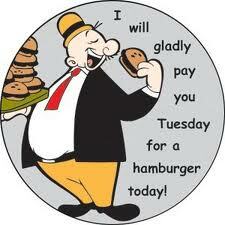 Wimpy is soft-spoken, very intelligent, and well educated, but also cowardly, very lazy, overly parsimonious and utterly gluttonous. He is also something of a scam artist and, especially in the newspaper strip, can be notoriously underhanded at times.
" I YAM what I YAM"
Popeye is depicted as having superhuman strength, though the nature of his strength changes depending on which medium he is represented in. Originally, the comic-strip Popeye gained his strength and invulnerability in 1929 by rubbing the head of the rare Whiffle Hen. 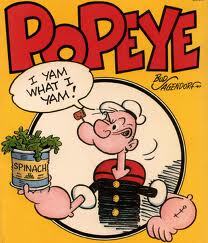 From early 1932 onward, especially the cartoons, Popeye was depicted as eating spinach to become stronger. The animated shorts depicted Popeye as ridiculously strong but liable to be pummeled by the much larger Bluto before his eating of the spinach. 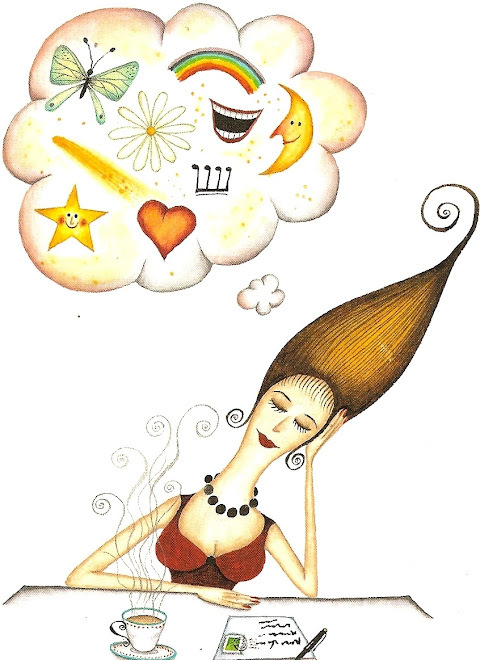 Do I want to be a Wimpy or a Popeye? Nice to know that Eternal Life is a GIFT! lifestyle choices that are gluttonous. if you show no appreciation for it and misuse it. He's got a plan... rest in him and feel the miracle of his strengths and Joy in the mist of your pain while seeking healing.